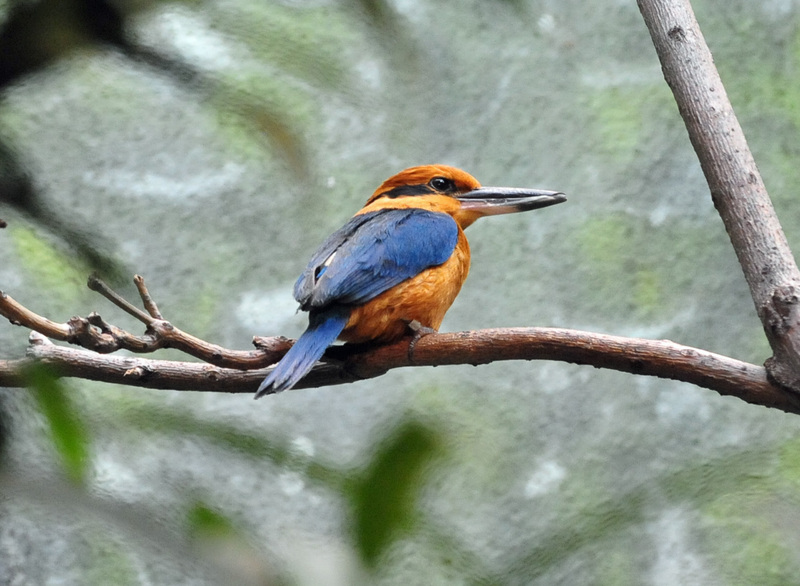 The last wild Guam Micronesian kingfishers were hustled off their remote Pacific island home more than 30 years ago, when they were airlifted to American zoos after invasive brown tree snakes drove them to the brink of extinction. While the birds are closer than ever to returning to Guam’s forests, the snakes that stripped Guam of much of its bird life remain a formidable obstacle. The U.S. Fish and Wildlife Service is making plans to release the colorful bird (called the sihek in Guam’s native Chamorro language) on other islands without snakes. The U.S. Navy also recently committed $20 million to making Guam’s forests more hospitable to the kingfisher. But the bird will be able to come home safely only if researchers can somehow figure out an economical way to control the snakes, which were accidentally brought to the island as stowaways in cargo ships after World War II and have been stubbornly resistant to past eradication efforts. “I’m not optimistic that we can get rid of the brown tree snakes before the kingfishers go extinct,” says Dylan Kesler, a research associate at the California-based nonprofit Institute for Bird Populations. Kesler said it would take a “magical solution” to convince him to alter his bleak prediction. The kingfisher’s situation has become more desperate because of the limitations of the captive breeding program that has kept the species alive since the late 1980s, when 29 of the last kingfishers on Guam were sent to zoos. About 150 kingfishers live in captivity now, but zoos are running out of space for the kingfishers, which are aggressive around other birds and eat an expensive diet of anole lizards. For the population to grow like it needs to, the birds must be reintroduced to the wild. And if the brown tree snakes weren’t still infesting Guam’s forests, the U.S. Navy’s recent announcement might herald a welcome opportunity to do so. The Navy’s unlikely interest in kingfishers stems from its plans to relocate several thousand Marines and their family members to Guam from their current base in Okinawa, Japan, as part of an agreement with Japan that dates back to the George W. Bush administration. Adding more housing and training facilities to the existing base on Guam will cut into forest habitat that the kingfisher could someday reoccupy. The federal Endangered Species Act requires the Navy to make up for the damage to the kingfisher’s habitat, so last June, the Navy committed to preserving five thousand acres of land for kingfisher habitat on Guam, and to allocating $20 million over ten years to make the land truly suitable for kingfishers again. But there’s dispute about whether Guam’s forests will ever actually be safe for kingfishers, and if so, when. The Navy plan “would keep some habitat around for eventual release on Guam, but who knows how far out that is,” says Jeff Walters, a biologist at Virginia Tech. “At this point it’s not going to do anything for the kingfisher for the next ten years at least.” A public relations representative for the Navy did not respond to inquiries seeking an interview. The U.S. Fish and Wildlife Service would like to try a small experimental release of kingfishers on a different island, without snakes, but has yet to secure all the necessary funding. The result is a dilemma for kingfishers and those who want to save them: There is suddenly ample funding to preserve forest on Guam as habitat for kingfishers – but the birds could not survive there today because of the brown tree snakes. Meanwhile, there’s not yet adequate funding to take the next crucial step to keep the species alive by releasing the birds on a different island where they might have a chance to thrive. Funding is definitely an issue for reintroduction efforts, says Megan Laut, a scientist at the U.S. Fish and Wildlife Service’s office in the Pacific, but she thinks the Fish and Wildlife Service has identified “some potential sources of money to get some of it started.” She anticipates successful releases on other islands will happen within the next five years, which will buy time to eventually release kingfishers on Guam once the snakes are under control. To be removed from the endangered species list, the birds must return to their original home on Guam. Part of the Navy’s funding for habitat management will go towards combating the brown tree snake. But past efforts to wipe out the tree snakes have failed, and promising experiments dropping dead mice containing acetaminophen (the active ingredient in Tylenol) as snake poison have only been tried on a small scale so far. Even so, biologist Steve Miller of the Fish and Wildlife Service thinks there’s reason to be cautiously optimistic. “In the past year and a half or so we’ve become much more positive about the real potential of recovering endangered birds in northern Guam because of brown tree snake control efforts,” says Miller, who hopes that within a decade large areas of Guam will be safe for kingfisher reintroduction. Diane Vice and Suzanne Medina, biologists at Guam’s Division of Aquatic and Wildlife Resources, are concerned. They see waning interest in the birds from zoos, as well as diminishing habitat on Guam, and have a sense that others are giving up hope that the kingfishers and other endangered birds can return to the island. Still, they are determined to keep working to get the kingfishers back in the wild on Guam, and are making plans to release a pair of kingfishers on a small island south of Guam without problematic invasive species. Glad you ended with DAWR’s take on the situation! There is funding to recovery MK – DAWR has the funding necessary to release and monitor sihek – We just need to complete the paperwork necessary for working with a Federally Listed species in a different political jurisdiction, including formalizing partnership agreements. The sihek will return to Guam. For starters the brown treesnake control techniques are rapidly developing for landscape scale application. DAWR could have introduced sihek years ago with small scale snake control technologies and shown success however, the partners were not on board yet. Glad that everyone is willing to move forward with sihek recovery! Thanks for bringing the issue to light.